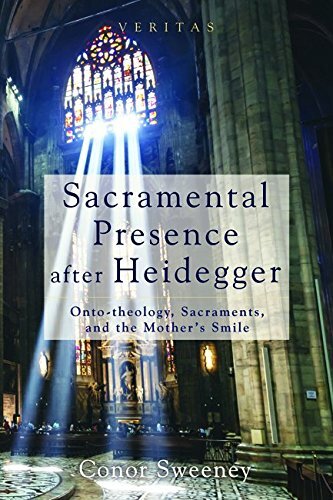 Newly available from the Centre of Theology and Philosophy’s Veritas series: Sacramental Presence after Heidegger: Onto-theology, Sacraments, and the Mother’s Smile, by Conor Sweeney. Theology after Heidegger must take into account history and language as constitutive elements in the pursuit of meaning. Quite often, this prompts a hurried flight from metaphysics to an embrace of an absence at the center of Christian narrativity. In this book, Conor Sweeney explores the “postmodern” critique of presence in the context of sacramental theology, engaging the thought of Louis-Marie Chauvet and Lieven Boeve. Chauvet is an influential postmodern theologian whose critique of the perceived onto-theological constitution of presence in traditional sacramental theology has made big waves, while Boeve is part of a more recent generation of theologians who even more wholeheartedly embrace postmodern consequences for theology. Sweeney considers the extent to which postmodernism a la Heidegger upsets the hermeneutics of sacramentality, asking whether this requires us to renounce the search for a presence that by definition transcends us. Against both the fetishization of presence and absence, Sweeney argues that metaphysics has a properly sacramental basis, and that it is only through this reality that the dialectic of presence and absence can be transcended. The case is made for the full but restless signification of the mother’s smile as the paradigm for genuine sacramental presence.